Also known as "Lovers of Paris." In French with English subtitles. The second of director Julien Duvivier's two cinematic contributions of 1957 was Pot-Bouille (Boiling Pot). Based on a novel by Emile Zola, the film stars Gérard Philipe as Octave, an opportunistic Parisian youth who hops from bed to bed -- and from bedmate to bedmate. Young or old, plain or beautiful, Octave loves and leaves 'em all. His romantic rovings come to a halt when he meets pragmatic businesswoman Mme. 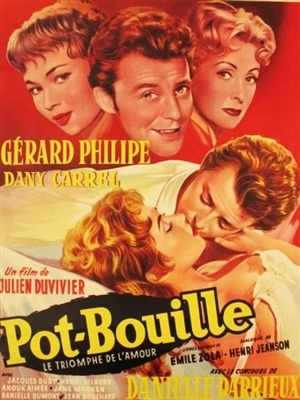 Hedouin (Danielle Darrieux). Apparently impervious to Octave's charms, Mme. Hedouin nonetheless marries the boy and transforms him into a useful (and least to her) member of society. Director Duvivier never misses an opportunity to contrast the respectable facade of Civilization with the unvarnished, often depraved truth beneath the surface.